As I said last year in this post The Beauty of a Local Tour, sometimes it’s far easier just to put your faith in a local tour operator rather than trying to do everything on your own. There are some places where you don’t have a choice really, like the Valley of the Kings in Egypt or the DMZ in Korea. You go escorted or you don’t go. In other places, like Vietnam, it can end up costing you twice as much to go exploring independently as it does to just pay up and hop in the van. It depends on where you are though as to how much you’ll pay. This tour out to Teotihuacan is around $28 to $50 depending on who you book it with, which is not much if you’re on vacation. If you try to visit the Chichen Itza ruins from Cancun, however, holey moley. The prices are all over the place. Viator charges $55, which is quite a deal for such a long day and including admission. When I was last in Cancun though, I saw prices posted at hotels for $150. For that amount you could take a first-class bus, spend the night at a nice hotel, and bus it back the next day. Check out the story for more on the pyramids in Teotihuacan and even if you’ve already seen lots of ruins, these are still worth checking out. The structures and the city are both massive and since this wasn’t built in a jungle, you can really get a feel for the full scale of it from atop the Pyramid of the Sun. Highly recommended. 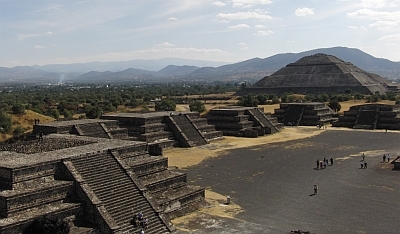 My dad owns a travel company in Mexico City and I have to say I have been to Teotihuacan too many times to mention. It is a beautiful place and there are too many things for you to discover there. Climbing the temple of the sun is of course fun, but what I have noticed is that not many tourist visit the museum right behind it. The other hidden gem is to the back of the complex there is a newly excavated mural you can go see. It has all these little characters you can check out. It is kind of an ancient “where’s waldo.” My favorite one is of the guy doing dentistry work on another guy (yes, they had dentistry back then). I enjoyed Teotihuacan have been to Chichen Itza too, I think Teotihuacan tops it though – except for all the vendors trying to sell you junk. Re the prices fro Chichen Itza I think the prices are “all over the place” because of the sheer volume of tourists wanting to go and therefore a huge range of different packages. At Teotihuacan when we went there were perhaps 20 other people there, at Chichen Itza you have thousands every day. If you want a cheap and cheerful tour then you cn do it for around $50, but if you want to fly there and stay overnight in a nice hotel it’s going to cost several hundred. Of course there are lots of other tour itineraries in between those two extremes with food/without food, limos, private tours, stops on the way at other attractions etc. What tour companies offer for closer to $28? Thank you! 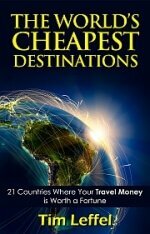 The ones offered at the hostels are usually the cheapest. Not sure what the current price is but with the peso at a record low, I can’t imagine it has gone up.